A building’s architecture plays a large role in interior design. Even if you’re creating an open floor plan, the basic bones of your space (and of the others on your street) are characteristic of the era in which they were built. It means your space has an existing narrative! If we ignore that narrative while using interior design to tell your story, the two may sit at odds with each other and look incongruous. It’s our job to find harmony between the two and to create a cohesive story that feels uniquely yours. To show you what we mean, we designed this high concept guest bedroom that fuses Mediterranean-inspired architecture with our signature modernist style. Because our goal was to blend old with new, push color boundaries, and create something wholly unique, we didn’t recreate a typical Mediterranean villa. Instead, we let the architecture inspire a vibrant color palette. Hues of yellow and red create a warm and hospitable welcome, while robin’s egg blue bedding gives a refreshing nod to the sea. 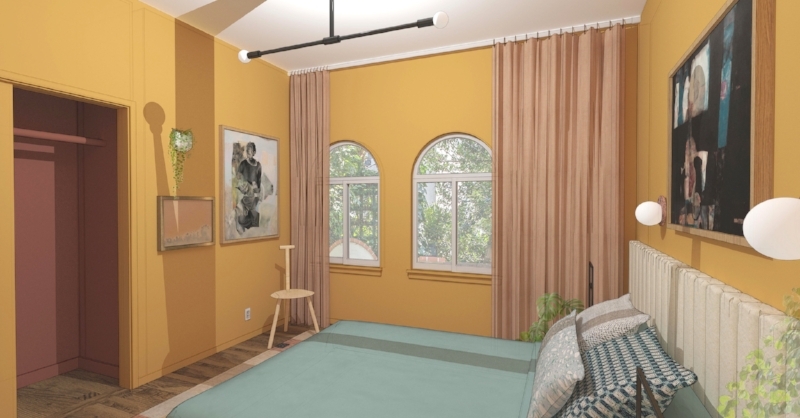 Mediterranean architecture is also known for arches and curves, so we combined the circular elements of the sconces and the ceiling fixture bulbs with the clean lines of the ceiling fixture itself, a modern chair, and these functional yet minimal nightstands. In general, art is a great way to tie a room together, especially when you’re marrying genres. These contemporary pieces by Robert Szot (left) and Paul Wackers (right) echo the room’s warm and colorful palette and create further harmony between lines and curves. Lastly, plants are the final piece in evoking an airy Mediterranean retreat and just might inspire this house guest to throw open the windows! In the end, this room tells a specific story for a specific guest. It’s the perfect example of not fighting or ignoring your home or building’s architecture, but having the courage to weave nuances of it into the interior design. Let multiple influences create your narrative, and you might be surprised by the richness of the results. What styles would you want to mix together? Tell us in the comments below!